The house you’ve had your eye on has advertised an Open House, and though you haven’t started your official house hunt, you’re dying to see it. If you’ve never been to an open house, there are a few things you need to know before you visit--you want to make as good an impression as the house! - Dress casually, and maybe even wear slip-on shoes, as some homeowners prefer guests to remove their shoes. - Be on time (maybe even early so you can be the first ones there): unless there’s an absolute emergency, you don’t want to get there when lots of others are in attendance, nor do you want to get there as the agent is locking up to go home. - Let yourself in! An agent may greet you at the door, or they may be waiting for visitors in a central room. Remember that different agents have a different method, so be prepared for a self-tour, or an agent who would like to give you a tour. - Signing in is sometimes optional, but some homeowners require it for their protection, and if you’re ready to start looking for a home, the attending agent can have your contact information so you can talk with them about your needs. - If you already have a buyer’s agent, the polite thing to do would be to let the attending agent know who your agent is. - While others are looking around, wait until they’re out of a room before you go in, giving them space and privacy. - Most houses on the market don’t have closed access, but if you come to a closed door at an open house, ask the broker if it’s okay to go in and look around. Sometimes another guest has mistakenly closed a door. - At the same time, don’t open medicine cabinets or anything else that could have the seller’s sensitive personal items, and make sure it’s okay to check out closet space before you go into the bedrooms. - Only take photos with permission. Most of what you need to know is already provided in the open house flyer and online. 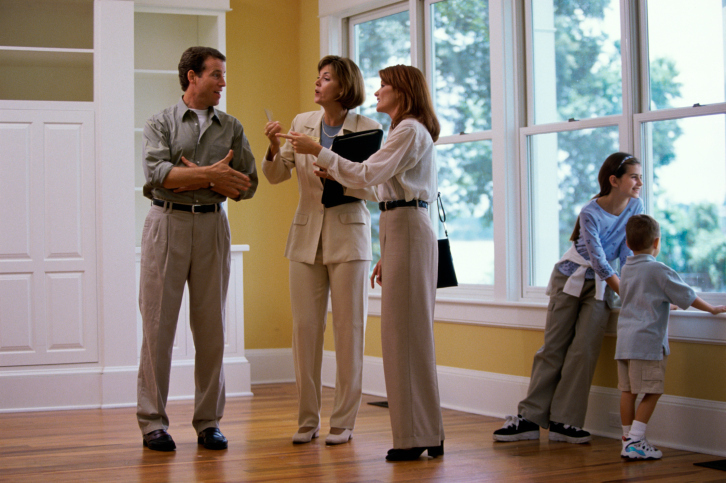 Take the brochure or flyer the agent has available and take notes on it as you tour the house. Once you’re finished with the walkthrough, stop and ask the agent any questions you may have about the house, and write those answers down. This is especially helpful if you’ve taken a day to visit several houses and will make any discussions with your significant other or your agent much easier. Courtesy of Chester County PA Realtor Scott Darling. What a View!!! Overlooking a wide expanse of Chester County. Enjoy coffee in the morning or a cool drink in the afternoon. You will just love this location on a private drive. This beautifully landscaped property has great privacy but also nearby neighbors. You get the best of both worlds. When you enter this home, you’ll instantly notice the wonderful hardwood floors and a soaring stone fireplace (propane) reaching for the top of the vaulted ceilings. This open floor plan offers a kitchen with a breakfast bar, and living and dining areas all combined as one. The sliding glass doors lead out to a massive deck and those wonderful views. There is a master bedroom with a connecting bath and sliding glass doors to the deck as well as two other bedrooms on this level. The lower level offers a finished area with a half bath as well as a utility room that includes your laundry area. There is also a door to the attached two car garage. A new septic system was just installed with a two-year warranty so there should be no worries there. Also, the seller had a camera system installed around the house so you’ll be able to see what’s going on even when you’re not home. This is a nice country property but not too far out in the country. Come take a look. Additions, because of needing a new foundation, could be started in late Winter/early Spring when the ground is still cold and more compact. It makes for better digging and concrete pouring and setup. Exterior door replacement would be convenient any time except Winter, just in case there are any issues and the doors aren’t a quick switch. 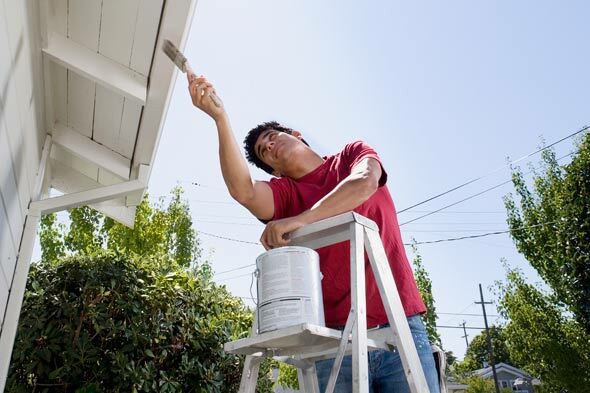 Exterior painting, for many reasons, is a better idea in early to late Summer, when temperatures are above fifty degrees. HVAC work, in non-emergency situations, should be done in the off seasons--new heater in warm months, air conditioning before it’s sweltering outside. Interior remodeling like kitchen and bathroom redo’s, can be done practically any time. The main thing to keep in mind here is warm months are busier for contractors, and that can mean a job done in a hurry, or higher prices. Outdoor projects, even though a popular time for construction is the warmer months, should be started in late Winter, simply because you want to be able to spend your Summer enjoying your new outdoor space! Refinishing hardwoods is probably best completed during the times of year when humidity is low for the best finish, and so windows can be opened to allow air circulation to help get rid of any associated odors. Roofing, believe it or not, may get better results in hot months of the year, as the most common materials used will need warm temps for the best performance. Window repair/replacement is managed well during warm months or when frequent rain isn’t a factor. Keep in mind that Spring and Summer are busiest time for contractors. If you are hiring your job out, the process should be started long enough in advance that you don’t have to be put on a wait list. On that same note, during slower months, a contractor may give you a deal on the work, because there aren’t other jobs to be done, and you get their full attention! Planning is key for a smooth finish on any project, any time of year. It’s time to get ready to put your home on the market, and there are some things to think about before you have it listed. 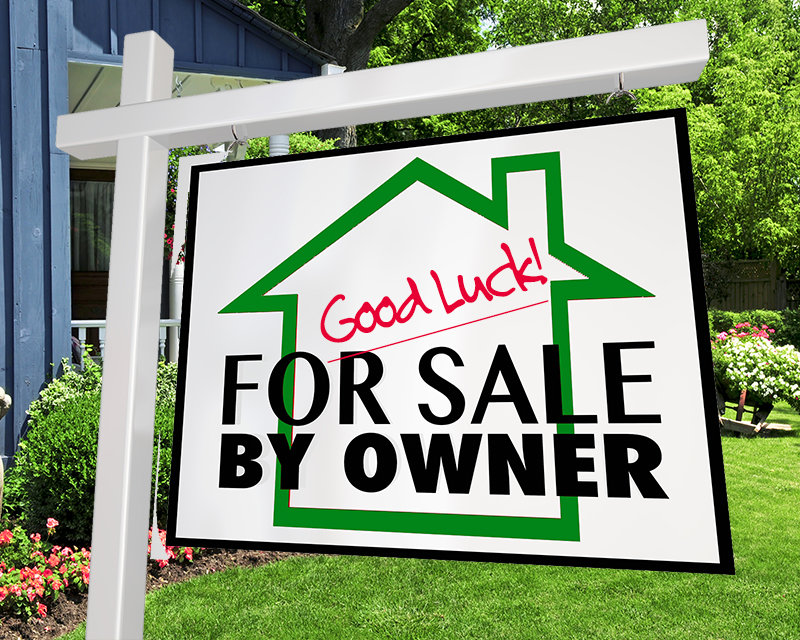 There’s work to be done, and some dos and don’ts that should be taken into consideration if you want your home to sell! - The exterior of your home is the first thing a potential buyer sees; paint the siding, if necessary, and make sure the roof is in great shape. - Clean up the yard, front and back, and add some seasonal plantings for color. - A deep clean inside is necessary. Wash windows, (inside and out), walls, draperies, scrub the bathroom’s every cranny, and shampoo the carpets. - If you have pets or a smoker in the home, a professional clean may be necessary, or even a new coat of paint on the walls. Pet odors and cigarette tar stay on everything. Ask a friend or neighbor to come in and do a smell test and tackle any issues that they share with you. - Deciding what colors to paint the walls shouldn’t be of your personal taste. Choosing neutral colors is best, and don’t stop at the living areas walls--paint every room. - Check all the doorknobs, and if any are sticking or simply not working, replace with similar hardware, or replace all of them. It’s also important for all the exterior door locks to be in proper working order and replace any that aren’t. - Major repairs or restoration should be done by a pro or an experienced DIYer. If you choose not to make a repair that you know is needed, you’ll have to be up front to your agent, make the needed fix is listed in your disclosure, and be ready to lower your selling price. - Sellers want their home to stand out, but don’t overdo it! Using generally popular fixtures and finishes is better than going with the latest trend. - Even if your storage space is limited, make it appear like there’s plenty of room. Remove seasonal clothing from closets, as well as occasionally used kitchen gadgets from cabinets and counters, and put them in storage with the rest of your things. - Consider staging, and if you can’t afford to go full scale, find a designer that will use your furniture and decorative pieces to maximize space, as well as have it looking its best. Lastly, don’t go it alone; find a RealtorⓇ that knows all that you don’t about selling your home. Using an agent gets your home “out there,” and will make the process easier for you as well as for the buyer. Can you see yourself living here, sitting poolside with a cold drink, a hat to shade your eyes and relaxing music in the background? The outdoor aura is just one of the fine things you’ll enjoy in this home. Having a first-floor main bedroom and a private updated master bath makes living here very easy. The main floor consists of a formal living room, formal dining room and comfortable family room with a beautiful fireplace and sliding glass doors leading to the deck and patio overlooking the pool. The eat-in kitchen with an island has been updated with solid wood cabinets. There’s also a built-in desk area with extra cabinets too. Recessed lighting adds to the ambiance on the first floor as well. A separate laundry area, powder room and a “family entrance” complete this level. Upstairs are three spacious bedrooms and another updated full bath. Located in the Welsh Ayres Community and just steps from the Uwchlan and Struble Trails is a huge bonus for you outdoor lovers. The neighborhood is friendly and you can even walk to the elementary school (Shamona Creek). Shopping, the train station and many main arteries are nearby so travel is made easy. Come by for a look. Chester County PA single-family homes saw pending sales increase by 9.2% in February 2019 when compared to February 2018. 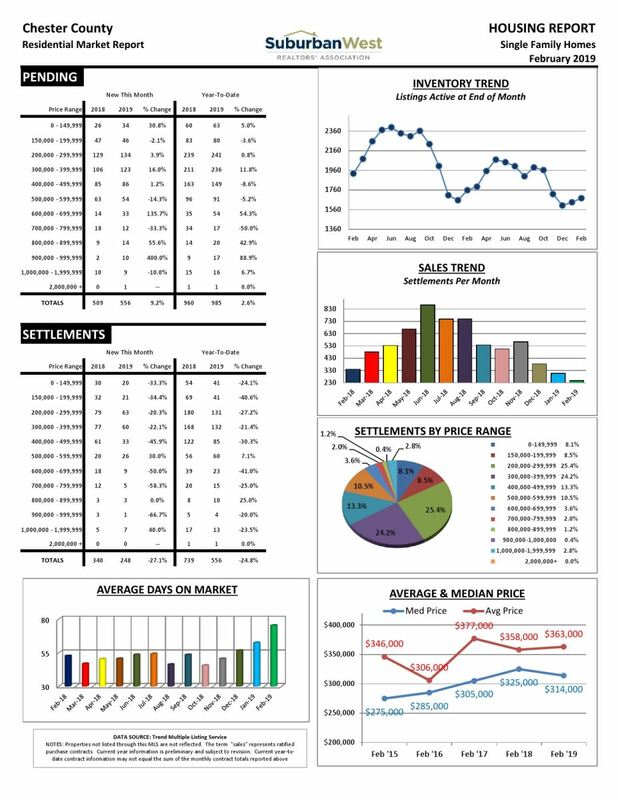 248 homes sold in February with a median sales price of $314,000. The average sales price increased by 1.4%, and homes were on the market 20 days more. If you are thinking about selling your home get a free instant home evaluation Learn More. What To Do With Old Devices? If you’re like many people this time of year who are cleaning out or following the new “simplify” craze, you’ve come across a drawer filled with old cell phones and devices. Don’t throw these devices in the trash--they’re bad for the environment. They can be put to good use, whether by yourself or someone else! Just make sure you reset the device settings to the factory settings. If you’re not sure how, DealNews has a guide to help you with that. Now let’s see what we can do with these unused gadgets! - Recycling could be the easiest thing for you. Get all of the devices in a box, and either call your local waste management to see where you can drop them off, or go to the Sustainable Electronics website, and click your area on the interactive map, and it shows you where you can send or drop off your items. - American Cell Phone Drive is an organization that helps raise funds for thousands of organizations worldwide. Follow the link, type in your zip code, and it will direct you to local places that will gladly accept your old cell phones. 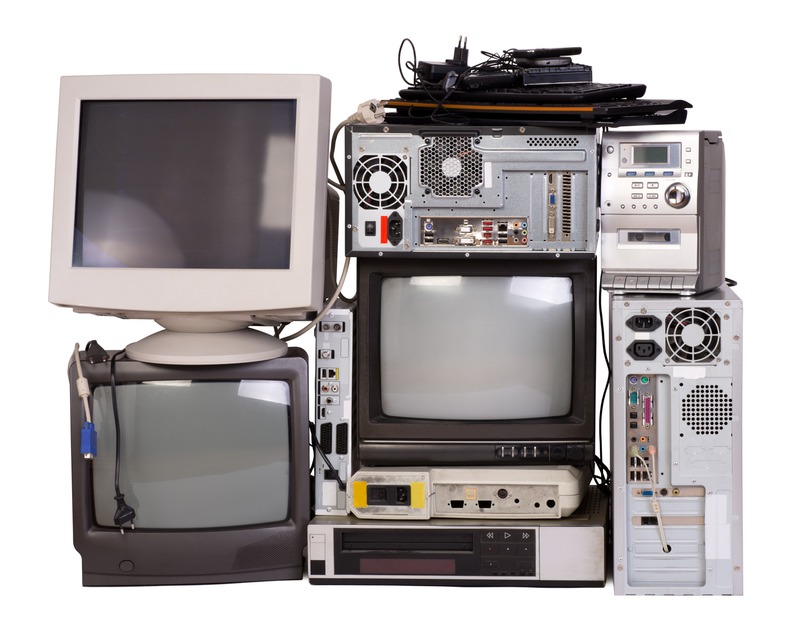 - Many large electronics retailers, online and brick-and-mortar, will accept your outdated gadgets for recycling, as well as the device manufacturers. In some cases, they will purchase newer items (usually less than three years old) and put the amount on the retailer’s gift card. A quick search online will help with finding what stores will buy from you. - Organizations such as domestic violence centers, daycares, schools and veterans’ associations are just a few places that may take the donation where it can be used for education or for emergencies. Call and speak with whoever is in charge to find out if they can use what you cannot. - You can always sell your devices, the newer the better, and put a bit of cash in your pocket, or donate the proceeds. Social media is full of local “yard sale” pages where you can post items for free or use an online auction site to sell your goods for a fee. - A laptop or computer tower takes a little more work to erase all sensitive information from, but these can be donated or recycled as well. - If the computer still works, call a local school, senior center, homeless shelter or youth program to see if they can use it. Many will gladly take a free computer. - Do an online search to see if any local retailers or recycle centers will accept your laptop or computer, and when you call, make sure they can recycle laptop batteries, too. In some cases, the lithium-ion batteries must be recycled separately. Not only will you be paring down your clutter, but you can help someone in need or simply keep dangerous metals from the environment when you recycle or donate your unused devices. Help yourself and someone else while you’re purging the junk! - According to realtor.comⓇ, the listing agent and buyer’s agent split about 6% of the home’s sale price. You’ll need to calculate how much it costs you to stage and photograph your home, get an MLS number, market the house, take time from work to schedule showings as well as host the showings, do all of the paperwork involved, and contact and pay attorneys and others who are involved in a home sale, and compare it to the commission you believe you’ll give up to an agent. - To be fair, the seller should offer a 3% commission to the buyer’s agent. Otherwise, most agents won’t bring anyone who’s interested to your home for a showing. - Sellers are responsible for any mistakes that have occurred once the transaction is in motion. If you don’t purchase errors and omissions insurance, you may end up paying out of pocket in court or settle out of court for those mistakes. - Pricing your home takes more than just an online search for sold homes in your area, and not only can you overprice your house, but you can lose thousands by underpricing. - Scammers abound and can cost you in many ways. These criminals target FSBO homeowners, because the scammers are savvy enough to make their offer look legitimate. - Beware the owner’s asking price. Since the majority of FSBO sellers don’t have the experience to set a good market value on their home, their quote will likely be too high. - Be prepared to wait some time to see the home. 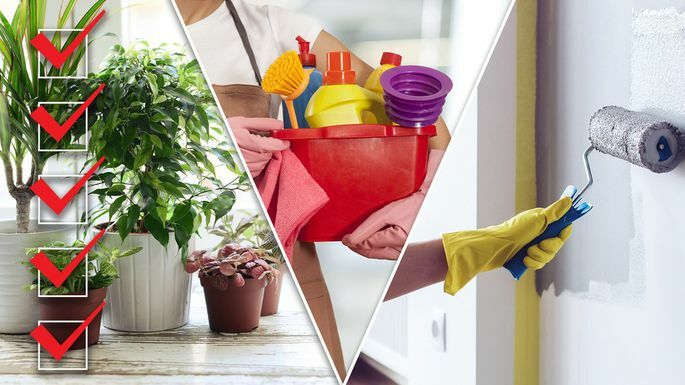 Most homeowners have full-time jobs, and you’ll have to view the home on their time, with them as your host. - If a seller tells you their house is in perfect condition, and you can save money by not hiring an inspector, walk away. Every house even brand-new houses should be inspected before changing hands. - Ask the seller what fees they plan on paying, and in the case that they ask to share the costs with you, it’s time to find another house. - Do your own research on the house, make sure the person you’ve talked with is the actual owner, and proceed with caution. There are scams that involve an empty house, FSBO signs, and scammers who will take your money and run, because they aren’t the rightful owner. The best advice: hire a RealtorⓇ. Not only are they the ones taking the risk in selling your home (or not), licensed real estate agents know everything you don’t know about selling and purchasing, devote all their working hours to home-buying, and can protect your investment as well as a buyer’s interests. If you have a good amount of equity in your home, and would like to make some home improvements, or need money to help you pay for a child’s college tuition, you may be considering using the equity in your home to help pay for these things. Let’s look at the difference between the two so you can make the right decision before you sign on the dotted line. - Basically speaking, a home equity loan is a second mortgage on your home, which is used as collateral by the lender. - The lender usually bases the loan amount on the difference between the homeowner's equity and the home's current market value. 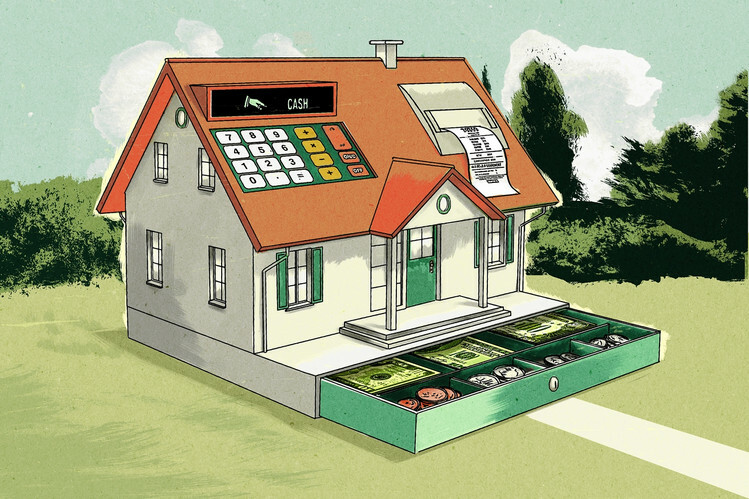 Investopedia can help you determine how much equity you have in your home. - Most lenders allow homeowners to borrow up to 85% of the home’s total value, but only based on what portion you actually “own.” If you haven’t finished paying your original mortgage off, your equity will be less than someone who has paid off their home loan. - A home equity loan will be paid as a lump sum and comes with a fixed interest rate. You will know how much you must pay every month, in addition to your current mortgage payment. - Just like the initial purchase of the house, your credit needs to be in good standing, so have all your financial records in order when you meet with your lender. - HELOC’s are a second mortgage as well, but instead of a lump sum, the homeowner typically has a five-to-ten-year “draw” period where they have access to the amount of the credit. - During the draw period, some lenders allow interest-only payments on the amount, while some require principle-plus-interest payments. Either way, pay more than the minimum so the principal can be paid off before the repayment period. - Once the draw period is over, repayment of what credit you have used will begin. Keep in mind that these payments will be higher than the earlier amounts you’ve been paying. - Your line of credit can be used for anything, but if you’re thinking about an island getaway, or some other non-essential purchase, you are better off starting a savings fund. If you can’t meet the payments once the draw period is over, you could lose your home to foreclosure. - In some cases, a lender will close your line of credit early if your circumstances change. If you’re using that money to pay your child’s college tuition, you’ll no longer have access to it, creating financial strain. Before deciding to use either of these types of credit, find out if using the equity in your home is the right way to go. If you’re already having a hard time paying the bills, a home equity loan or HELOC will only put your further in debt. Contact a HUD-certified financial counselor to help you get your debt and other financial matters under control. - Just because the room is small doesn’t mean the walls have to be white. Paint in a color you love, bold or pastel, or wallpaper that makes a statement is as appropriate for a small room as a large one. - A small bathroom means smaller-sized fixtures and splurging on a nice cabinet or sink won’t hurt the pocketbook as much, while adding style. - Contrasting shower tile is a great way to add color to a bath and gives you a reason to keep the curtain pulled back, opening up the space, and showing off your colorful shower! - If your small bath or powder room doesn’t have a window, use decorative lighting for your focal point, and add wall sconces on the wall over the toilet, and on either side of the mirror. - Floor covers, and adhesive tile is simple to install, is available in endless designs and colors, and can be the feature for your small bathroom. - When new tile, paint, or wallpaper isn’t in the budget, add color through your accessories. Brightly colored curtain or shade, rug, and artwork can make the room. - Since most small bathrooms don’t have a lot of storage, you have to be creative and practical, or use functional decor. 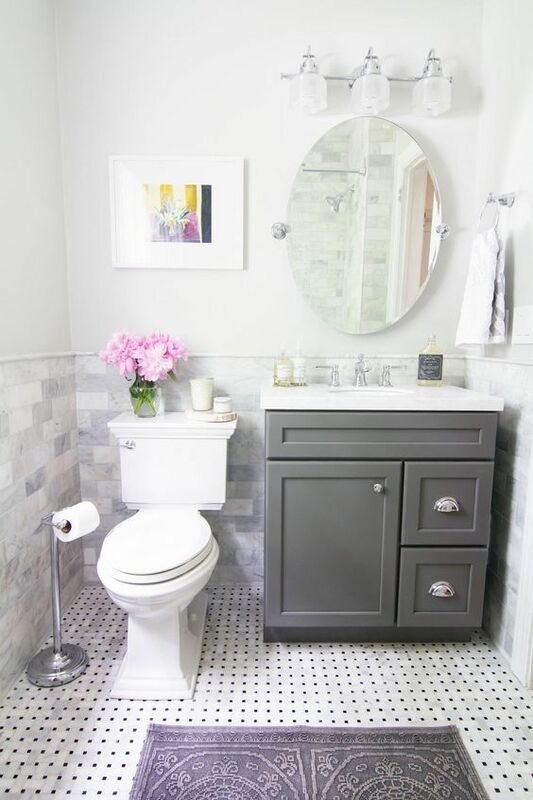 Check out these bathroom storage ideas from Good Housekeeping. - Weekend warriors or those who are confident enough in their skill level can create recessed shelving with this how-to from DIY Network. If you like the idea but lack the skills, call a reputable carpenter to handle this small job. - Large mirrors aren’t just for large bathrooms; using them in your small bathroom helps bring in the light, making the room appear larger. - Keep the less-is-more attitude when adding things to a small bathroom; a small plant, soap, and hand towel are all you need on the counter. Not only can you make your little bathroom stylish, you can cut down on clutter and keep it organized for smoother mornings or guest use. Don’t think of this project as a challenge, look for inspiration, and it may end up becoming your favorite retreat!